Welcome friends to Natasha in Oz! I can't believe that it's been so long since my last post and my last Say G'Day Saturday Linky Party! I really had such a terrible time with that awful virus but I'm finally feeling well again and am ready to get back to my poor neglected blog! 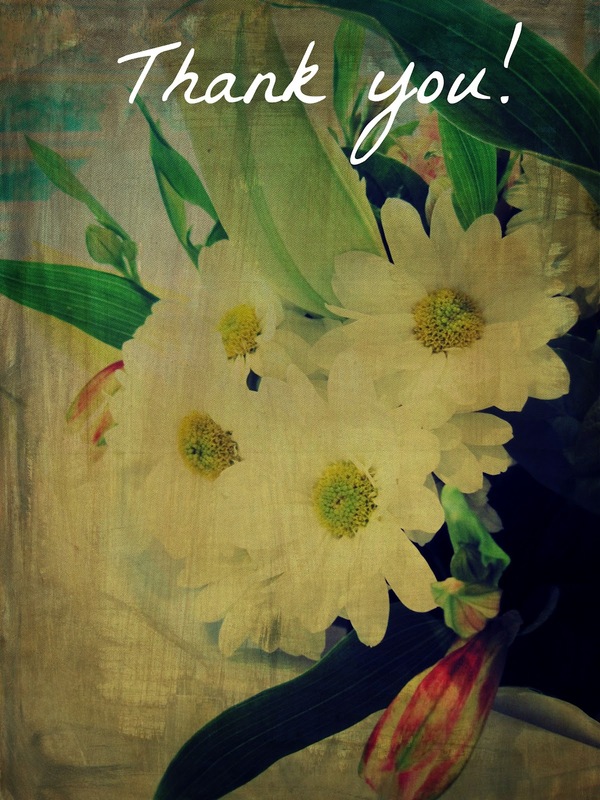 Thanks so much to my very sweet bloggy friends for your get-well wishes while I was sick. I really appreciate your kindness! This week I have been back in the kitchen and have been cooking non-stop! It's been so good to cook and bake again. Here's some yummy cupcakes I baked for a bake sale at Maddy's school. They were all sold within minutes! For this week's Say G'day Party I am sharing a recipe that our family recently enjoyed. 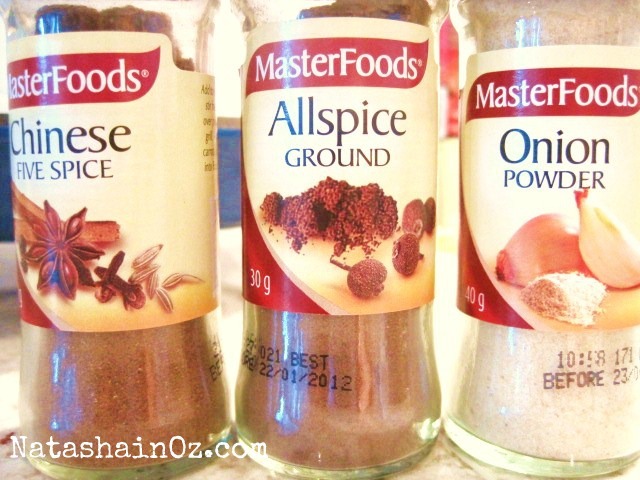 It is for an Asian style bolognese sauce that is made with hoisin and soy sauces instead of tomatoes and Five Spice Powder instead oregano! If your family is like mine pasta is a staple ingredient in your pantry because it is so versatile, inexpensive and delicious! Big Al would eat spaghetti every single night if he could-he loves it! The rest of us on the other hand need a bit more variety! 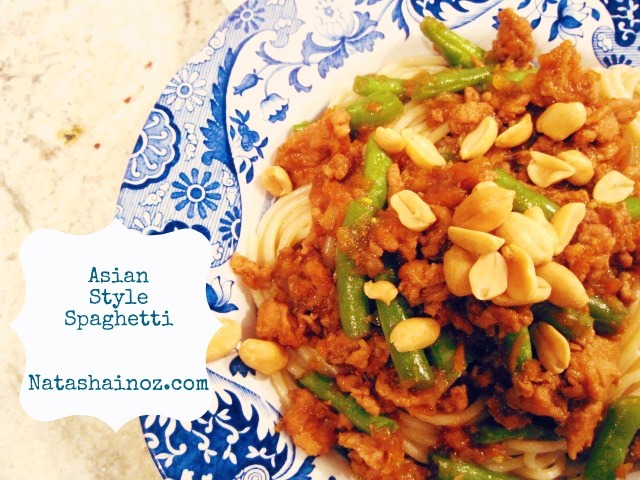 Most of the time I cook a tomato sauce made with ground veal and pork for my Italian style spaghetti but this Eastern style sauce is made with minced chicken and lots of Asian flavours. It was an instant hit with all members of the family and has become a favourite supper for Big Al! 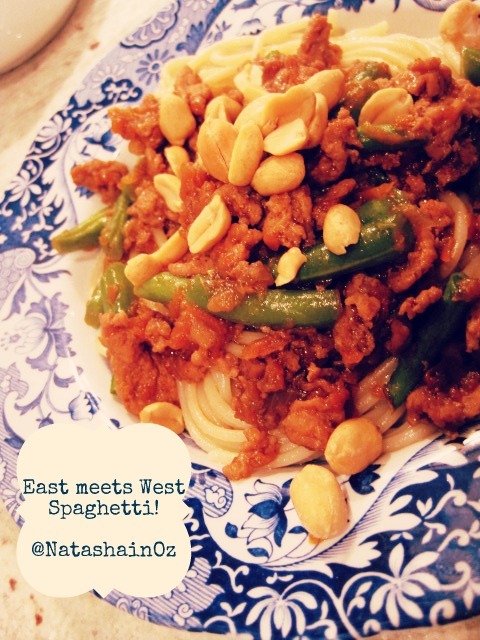 This East-meets-West Spaghetti with Ground Chicken is quick and full of interesting flavours. I'm sure you'll love it....Itmay even become a regular dish for your #SundaySupper! 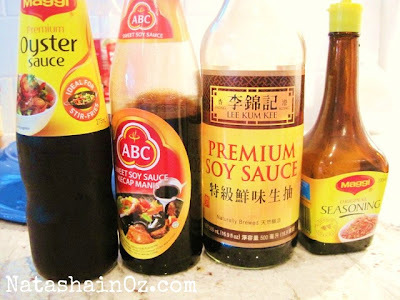 1/2 cup hoisin, 1 tbsp oyster sauce, 1 tbsp kecap manis, 2 tbsp Soy Sauce and 2 teaspoons Maggi Seasoning. 1/2 cup rice wine (or sherry) 1 cup water I box of your favourite spaghetti Vegetables such as sliced fresh mushrooms, sliced fresh snow peas, green beans, shredded carrots...anything you like! In a large nonstick skillet, heat peanut oil (or any oil that doesn't have an overpowering flavour) over medium heat. Add ground chicken and fry until cooked through, about 5 minutes. Add garlic, ginger, onion and spices and cook for 5 minutes. Add sauces and cook for 1-2 minutes. Add rice wine and water and bring to a simmer. 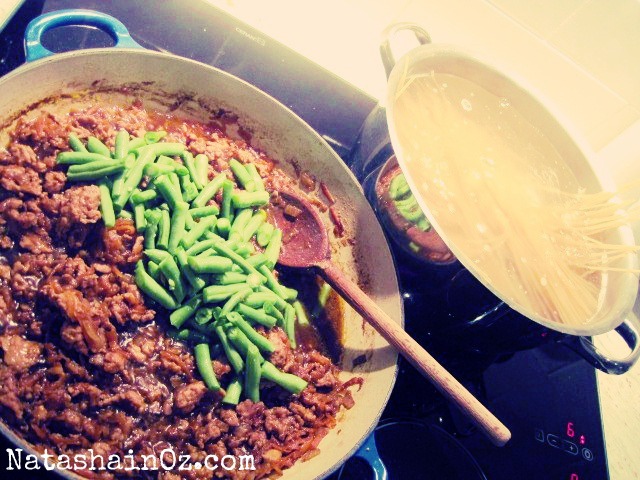 Cook until consistency is fairly thick, similar to bolognaise sauce, 30-40 minutes. Sometimes it takes longer for the sauce to thicken up, so I turn up the heat to medium high to speed up the process. Just remember to stir it more frequently. While sauce is simmering cook the pasta according to package directions then drain in a colander. About 5 minutes before serving add vegetables so that they remain crisp and don't overcook. When ready to eat, place pasta and chicken in serving bowls and sprinkle with peanuts instead of parmesan cheese to add a final Eastern flourish! So, what have you been making, crafting, baking or creating while I've been out of the Blogosphere!? Perhaps you have blogged about your favourite #SundaySupper, holiday destination or a room in your home? 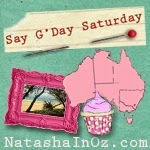 If so I would love it if you could link up your post to this week's Say G'Day Party! is a weekly link up where you can share any posts that you are proud of! If would like to join in with my Say G'day Saturday party, just link up the url of the post you would like us to visit to the linky tool below. Please also link back to me by adding a text link to NatashainOz.com or one of these bespoke buttons to your posts! Thanks for joining in! Don't forget to come back later so you can say G'day to bloggers from around the world! Thank you so much for visiting me today in my little corner of the world Down Under! 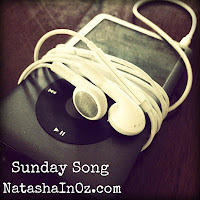 Please be sure to come back on Sunday to hear my favourite song for the week at this week's #SundaySong Linky Party! Really glad to hear you're feeling better, Natasha. I am glad that you are well and return to blog and kitchen. 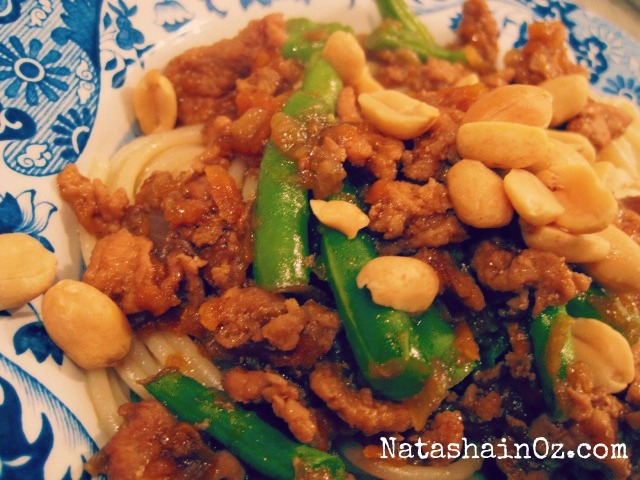 The recipe with pasta and Asian flavors seem delicious. Here in Greece, cook with tomato sauce or mushrooms or ground beef. I'll try your wonderful recipe. Thanks for the share with us. Glad you are feeling better, N! Thanks for hosting! Your dish sounds good. I lived in Asia for 12 years and find kiwi food quite bland. I love your twist on Italian Spaghetti and will have to try it out. I am linking up today, I tried a couple of weeks ago but your page wasn't up. Glad to see I can link up again. Natasha, glad to know that you are now feeling better. This spaghetti looks delicious. I'll give it a try. Your food looks so Yummy. Thanks so much for hosting your linky party so sweet of you. I hope you have a wonderful weekend with your family. so glad to see you're back! and i'd be crazy not to think those cupcakes look scrumpcious! Thanks for hosting this party. 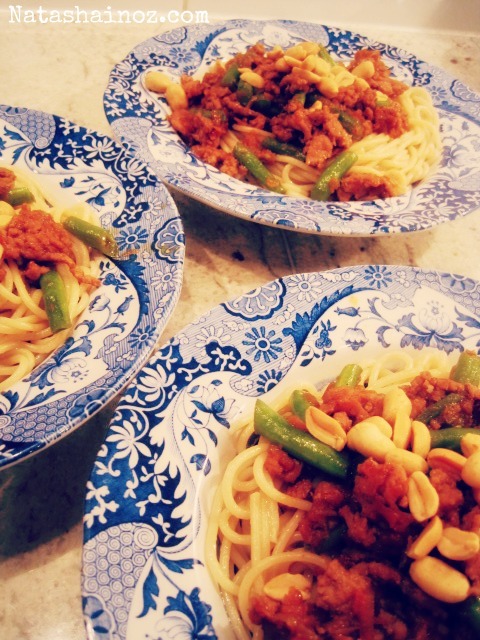 The Asian pasta dish looks delicious, I think my family would love it too. This look delicious! I am so glad you are feeling better! Thank you for hosting! Thanks for visiting our site and for the sweet comment. Also, thanks for the invite we have added your party to our list!! And so glad you are feeling better! Yummy! I've never heard of Asian style spaghetti. Sounds delish! Welcome back Nstasha! :) Glad to hear that you're feeling better! glad you're back and better! Hi Natasha, I found your site through a link on another blog. I'm your newest follower. Thanks for hosting the party. Looks like fun. Glad you're feeling better. The recipe looks delicious, I enjoy Chinese food so am looking forward to trying this variation on a theme. Hi Natasha! Thanks for hosting this great party! New follower too ;) Have a great week! Thanks, I am joining your party. Interesting recipe. Thanks for being a part of Seasonal Sundays. Natasha, Thanks so much for the invite. I'm all linked up and am now following your blog too. I would love to invite you to share at my Creative Thursday Link Party at www.michellestastycreations.blogspot.com. Have a great week. I'm so glad you are feeling better!! It's fun to be in the kitchen again, after a long time away, isn't it? Looks delicious!! I like Hoisin sauce. I've used it several times for stir fry. I'm pinning this. Thanks for sharing at Romance on a Dime!! That recipe sounds amazing... what an idea! Yum yum. Your Spaghetti looks wonderful! Thank you so much for sharing with Full Plate Thursday and come back soon! This looks so yummy! I can't wait to try it. Thanks so much for stopping by Creative Thursday this week. I couldn’t do these parties without you. Can’t wait to see what you link up next week. Have a wonderful weekend.